The new OSHA standard for respirable crystalline silica enforcement for the general industry and maritime industry began Saturday, June 23, 20181. However, OSHA has granted a 30 day grace period for employers making an effort to meet compliance1. OSHA is offering free compliance assistance in order to help companies meet the new standard of permissible exposure limit (PEL) of 50 µg/m3 and action level of 25 µg/m3. This means that employers or workplaces with at least 25 µg/m3 must conduct exposure monitoring to ensure the level is below the PEL of 50 µg/m3. Silica (SiO2) or crystalline silica is a colorless or white crystal2 commonly found in the earth’s crust3. The most common forms of silica are quartz, cristobalite, and tridymite. 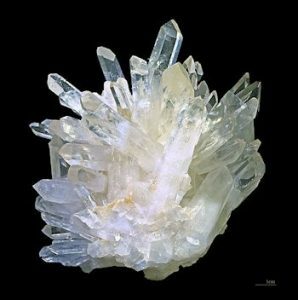 Quartz, the most prevalent form of silica, can be found in sand, stone, granite, soil, concrete and mortar2 & 3. Cristobalite and tridymite is found in volcanic rock and can become airborne to areas close in proximity to a volcanic eruption2. Crystalline silica is used to make ceramics, bricks, and artificial stone3. Sand and gravel containing 95% silica is utilized in road building and concrete construction2. Sand with 98% silica and low iron content is used to make glass and ceramics which can be found in foundry castings, sand paper, fracking processes, and large bodies of water filtering systems2. Finely ground silica flour is used in abrasive cleaners and inert fillers used in toothpaste, scouring powders, metal polishes, paints, and rubbers2. When quartz is heated to extremely high temperatures, cristobalite is formed to create refractory silica bricks to line furnaces, kilns, fireboxes, and fireplaces due to the high resistance to heat2. Silica becomes respirable when broken into tiny particles from industrial processes such as cutting, grinding, drilling, and crushing materials containing silica3. 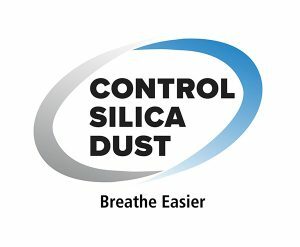 Respirable crystalline silica particles are 100 times smaller than ordinary sand and pose serious health side effects to the respiratory system when airborne and inhaled by an individual3. Exposure can occur in a nonindustrial setting such as the people that live nearby quarries or sand/gravel manufacturing facilities may be exposed to airborne respirable crystalline silica2. Silica is also found in ordinary objects such as abrasives, sand paper, detergents, grout and concrete but this exposure is minimal and does not pose a health risk2. For the most part, the harmful respirable crystalline silica exposure occurs in the workplace. 2 million people are exposed to respirable crystalline silica in the construction industry in over 600,000 workplaces4. The most affected processes include masonry saws, grinders, jack hammers, drilling rigs, milling, crushing machines, demolition machinery and tunneling4. The updated OSHA PEL is projected to save 600 lives per year as well as prevent 900 new diseases related to respirable crystalline silica exposure8. Long term exposure and short term high exposure to respirable crystalline silica is known to cause lasting respiratory side effects as well as increased risk to develop autoimmune, kidney and liver diseases. Silicosis occurs usually after long term (15 – 20 years) of continuous low concentration exposure5. 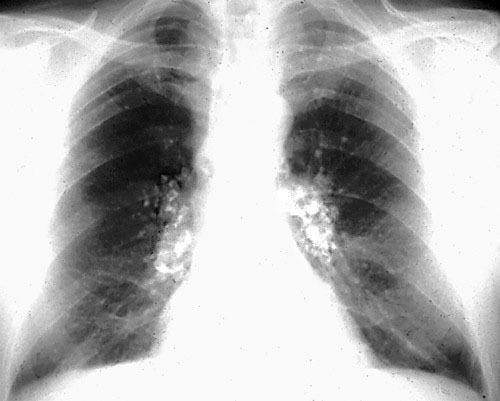 Silicosis is nodular pulmonary fibrosis6 which causes formation of scar tissue making it hard for the lungs to function and take in oxygen5. Acute silicosis can develop quickly and shortly after a high concentrated exposure to silica6. Acute silicosis is rare and has symptoms of fever and weight loss. Chronic silicosis refers to the long term low concentration exposure6. After 40-45 years of being exposed to the old OSHA PEL of silica (100 µg/m3) there is a 1 in 100 chance of developing silicosis7. Symptoms of chronic silicosis include shortness of breath when exercising and in later stages extreme fatigue, extreme shortness of breath, chest pain, and even respiratory failure5. Silicosis can be fatal and has no cure. Deaths from silicosis have declined throughout the years but other deaths from silica related diseases have not declined6. Silicosis not only affects the lungs but also affects the immune system increasing the chance of developing severe mycobacterial or fungal lung infections such as pulmonary tuberculosis6. Respirable crystalline silica is a known carcinogen and can cause lung cancer6. According to the 14th edition of the Report on Carcinogens, respirable crystalline silica has been identified as a carcinogen since 2000 and has been shown to cause cancer in rats2. Respirable crystalline silica lodges itself in the lungs or other parts of the body to cause cancer2. Some groups who have had high exposure to respirable crystalline silica have developed stomach or gastric cancer6. OSHA first started limiting respirable crystalline silica exposure in 1971 with the PEL of 100 µg/m3 7. OSHA updated the PEL in 2016 to 50 µg/m3 but only started enforcing it October 23, 2017 for the construction industry8, June 23, 2018 for general and maritime industry, and will not enforce it until June 23, 2021 for the oil and gas industry9. For the first 30 days OSHA is granting a grace period and offering free on site consultation for employers who are making efforts to meet compliance1. If they have not at least completed air monitoring, OSHA will conduct it themselves and consider citations1. OSHA plans to release inspection and citation guidance to aide employers to meet compliance in the upcoming weeks1. Enforcement of medical exams at action level does not start until June 23, 2020 but will start June 23, 2018 for above PEL levels9. These guidelines do not apply to areas of minimal exposure such as mixing concrete for post holes, pouring concrete footers, slab foundation, or removing concrete formwork10. • Conduct Air Monitoring – Air monitoring must be conducted in order to determine the level workers are exposed to respirable crystalline silica. If it is above the action level of 25 µg/m3, employers must continually monitor the air quality to ensure it does not go above PEL, if so they must implement dust controls and provide respirators. • Written exposure control plan – Employers must compose a detailed report of the tasks that are exposed to respirable crystalline silica and methods to decrease the exposure4. This plan must detail four minimum elements in the workplace used to control exposure8. • Water Delivery Systems – A specially designed system created for each tool/application used to apply water at the source of dust emission to reduce airborne respirable crystalline silica. Safe cleanup of water must be conducted in order to minimize secondary exposure10. • Dust Collection Systems – A system that fits the tool to eliminate dust at the source10. 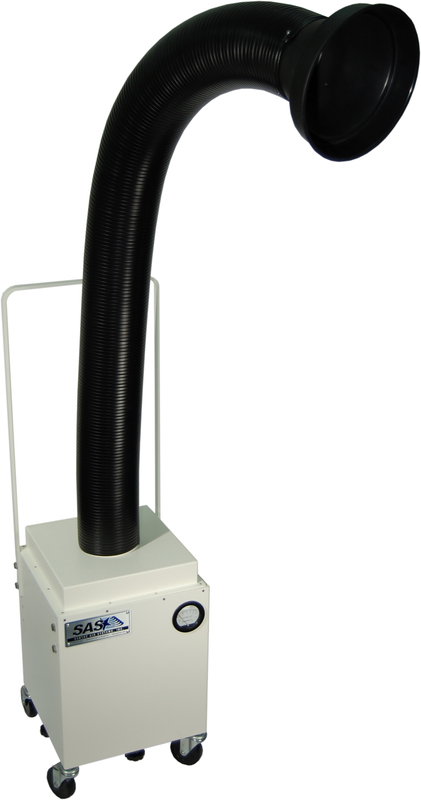 • Exhaust System – System to collect and filter dust for indoor or enclosed areas. Enclosed cabs must have intake air that is filtered with 95% efficient filter (MERV rating 16 or better)10. For some applications, local exhaust systems can be used but others ventilated work enclosures will be better suited9. After 6 months of enforcement of the respirable crystalline silica standard for the construction industry, there have been a large number of violations – 117 with 80% serious violations. 35 violations are for failure to conduct exposure assessment, 31 failed to implement engineering controls and offer respiratory protection, and 20 lacked a written exposure control plan8. These violations can help other industries know to start with an exposure assessment and to ask OSHA for compliance assistance. OSHA offers a free onsite consultation program that does not result in penalties. Instead, they utilize consultants to help employers become compliant by analyzing and offering systems of improvement. Depending upon the application, Sentry Air offers a solution to help your business become OSHA compliant for respirable crystalline silica exposure. Portable Floor Sentry (SS-300-PFS) will capture and filter airborne respirable crystalline silica at the source. 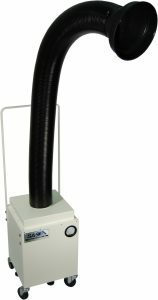 This unit features portability and an adjustable hose to move closer to the process. The Portable Floor Sentry allows multiple filter media to be housed inside the filter chamber for applications that emit both particulates and fumes. The hose and filter media are made of all flame retardant materials. Applications: large applications such as ceramic mixing, cutting stone, or glass manufacturing. Winged Sentry (SS-300-WS) offers a unique design with wings that help direct the contaminated air to the unit’s inlet without having the confinement of working within a hood. 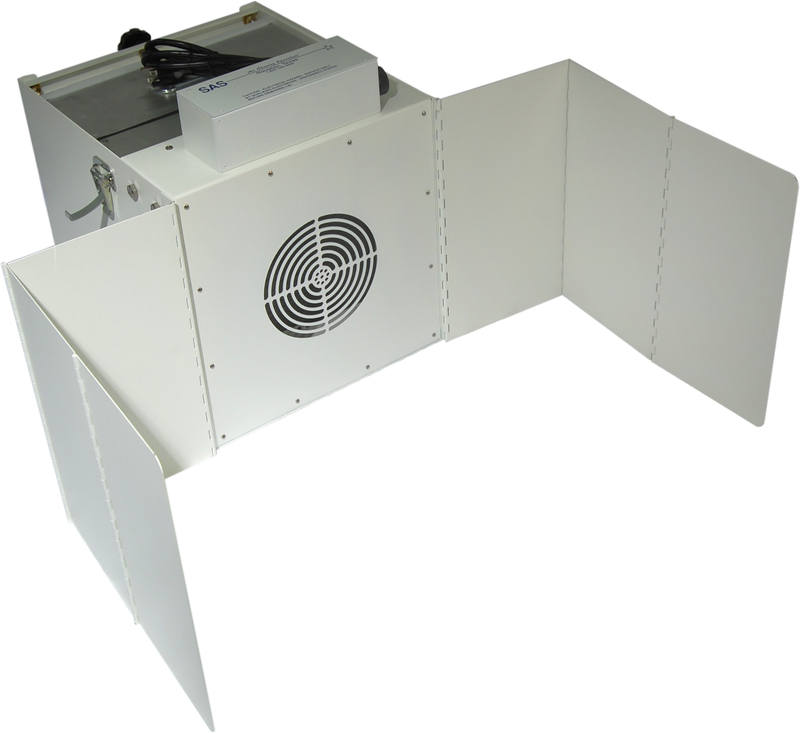 This small footprint benchtop fume extractor has adjustable wings to configure to multiple size workspaces. Ductless Fume Hood (SS-330-DCH) provides an enclosed ventilated workspace to provide extra protection between the process and worker. 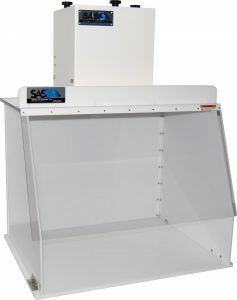 The ductless fume hood utilizes a powerful air flow to pull the harmful particulate away from the worker and filter it back into the ambient air. This easy to install unit does not require ductwork making it an economical solution. Our staff chemist, Luke Turner, conducted controlled testing of the Ductless Fume Hood (SS-330-DCH) fitted with a carbon pre-filter pad (SS-300-CFP) and HEPA filter (SS-300-HF). The test was conducted with a series of agitation cycles of a 5 lb sample of crystalline silica powder to create a constant plume of dust within the hood for 160 minutes. Measurements were taken at 4 points: A – interior of the hood – 6” below inlet, B – exterior of hood above outlet, C – 5’ from device, D – 5’ from floor. The collected measurements during the test were processed by an external lab and can be found below. Test point A had .63 mg/m3 or 630 µg/m3, while the other test points (B, C, and D) read .03 mg/m3 or 30 µg/m3. The analysis is limited to a minimum of .03 mg/m3 thus the amount of Si)2 could possibly be lower at test points B, C, and D meaning the efficiency rate of the filtration process could be higher than 95%. From these results it is apparent that the SS-330-DCH is an effective method of reducing the silica concentration to below the PEL level. For more information about the testing please read the full report, available by clicking the button below. Consult an industry expert today, please contact Sentry Air Systems Today! 1. “Silica Standard Enforcement Begins with Compliance Assistance.” Occupational Health and Safety Online, 13 June 2018, https://ohsonline.com/articles/2018/06/13/silica-standard-enforcement-begins-with-compliance-assistance.aspx. 2. National Toxicology Program, Department of Health and Human Services. Report on Carcinogens, Fourteenth Edition. https://ntp.niehs.nih.gov/ntp/roc/content/profiles/silica.pdf. 3. “Silica.” Occupational Safety and Health Administration. https://www.osha.gov/dsg/topics/silicacrystalline/. 4. Occupational Safety and Health Administration. “OSHA’s Respirable Crystalline Silica Standard for Construction.” OSHA Fact Sheet. https://www.osha.gov/Publications/OSHA3681.pdf. 5. “Silica – Health Effects.” Occupational Safety and Health Administration. https://www.osha.gov/dsg/topics/silicacrystalline/health_effects_silica.html. 7. Morrison, Kyle. “Long Overdue,” Safety and Health Magazine. 2013 Oct 1. http://www.safetyandhealthmagazine.com/articles/9319-long-overdue. 8. Sparkman, David. “What the First Six Months of Silica Enforcement Tells Us.” EHS Today. 2018 June 11. http://www.ehstoday.com/construction/what-first-six-months-silica-enforcement-tells-us. 9. Occupational Safety and Health Administration. “OSHA’s Respirable Crystalline Silica Standard for General Industry and Maritime.” OSHA Fact Sheet. https://www.osha.gov/Publications/OSHA3682.pdf. 10. Occupational Safety and Health Administration. Small Entity Compliance Guide for the Respirable Crystalline Silica Standard for Construction. https://www.osha.gov/Publications/OSHA3902.pdf. p 6-7, 35-36.